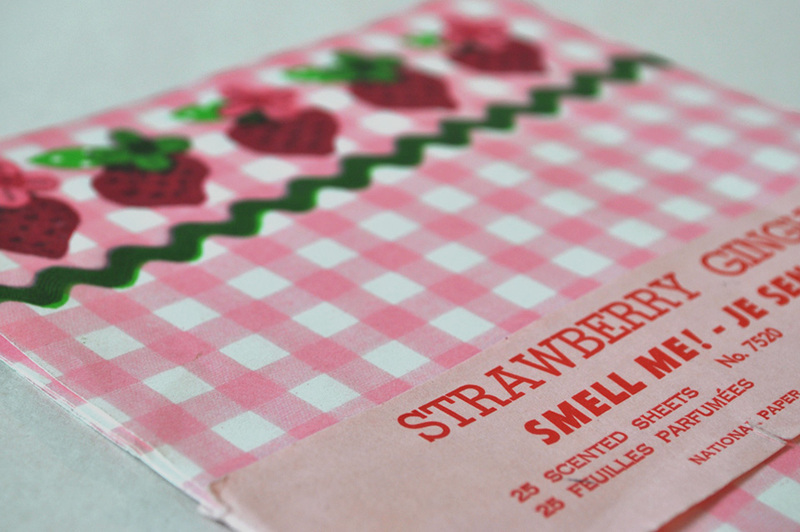 Strawberry Gingham “Smell Me! – Je Sens Bon” Scented Sheets. No. 7520. 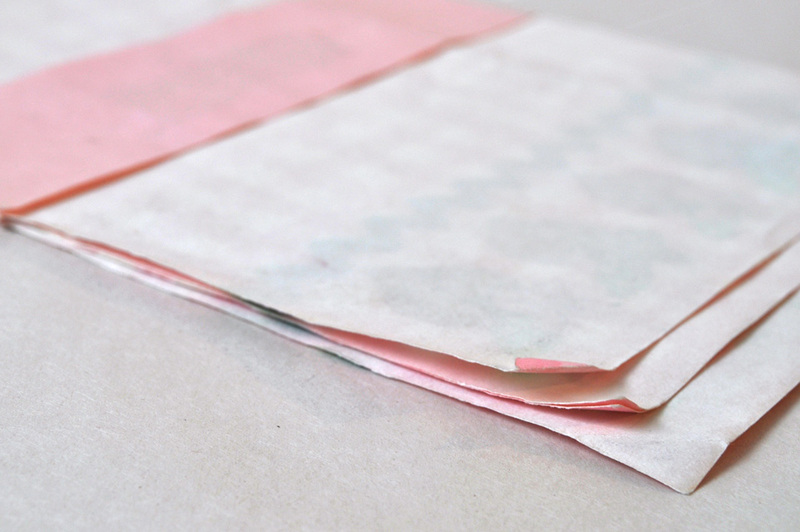 4 Sheets Remaining in Original Paper Band. I checked, and the company who made this stationery is still in business. They were founded in 1912 and are based in Hamilton, Canada. So, if you scratch the strawberries, there is a faint scent (still!) of strawberries. I’m allergic to them. The real ones. If you’ve ever wondered how to remember how to spell stationery, the “e” is for envelope. I got this tip from a post which mentions the obsolete meaning of the word. Both stationary and stationery have the same root in Latin stationarius, “for a person who was based at a military station. In medieval times a stationarius was a trader who had a fixed station — a shop — rather than travelling from fair to fair, like a pedlar. These were usually booksellers” Full article here. This stationery reminds me of Holly Hobbie, which I discovered is now a Mattel doll (since 2006). 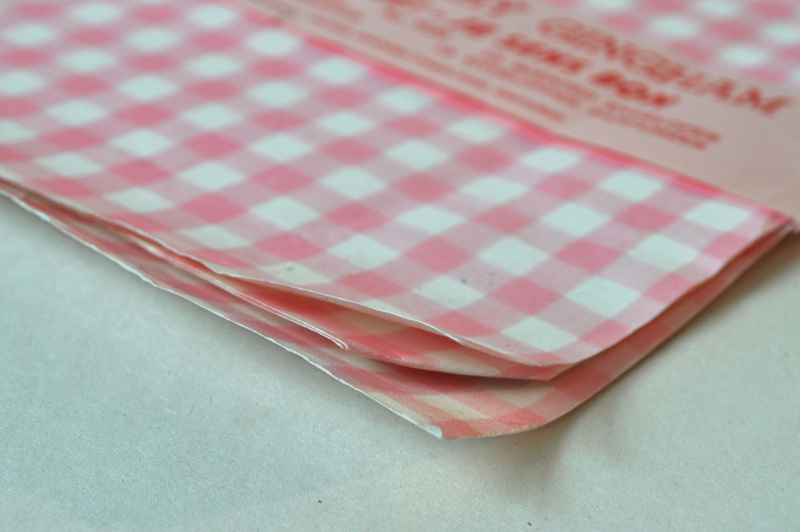 Status: Scan for future need of pink gingham pattern. Alt-title: Untitled Object No. 256 For Helping You Remember to Stop and Smell The Strawberries. What’s this Alt-title / Kill-ratio stuff all about and who is responsible for heading me down this garden path? Read all about it here. Taking these photographs also reminded me of pen pals and handwriting. I recently read an excellent article about why handwriting matters. “Handwriting is what registers our individuality, and the mark which our culture has made on us”. “People who don’t work with their hands are parasites” — Jenny Holzer Truism. Thanks for the little English lesson with the envelope reminder. It’s very useful to me, because it’s not my mothers tongue. Adorable, if you can say such a thing about stationery. Love the two fonts. 🙂 Yes, those get added to the collection of fonts from this project.